Content marketing is a great tool for building your business…if you use it right, that is! Inconsistency—You post or email content whenever the mood strikes or whenever you have time, which would be never! Not thinking about SEO—I’m not talking about keyword stuffing, but simple SEO tactics anyone can use easily to improve organic search. Poor headlines—If your headlines stink, your content won’t get opened. Quantity over quality—You post and email all the time but don’t say anything useful. 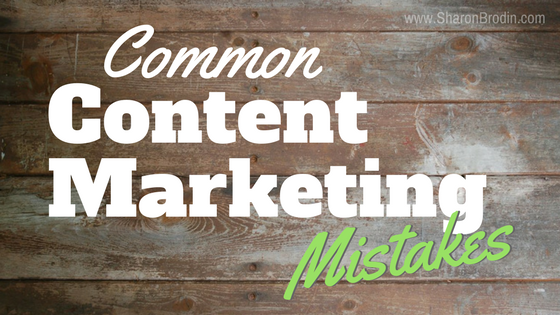 No promotion—Sorry, but readers won’t come to your blog looking for your content. Sticking to one type of content—Different readers like to consume their content in different ways. Not going mobile—Mobile users will ditch your content right away if they can’t read it. No strategy or goals—No strategy = little effectiveness. Not relevant to your audience—Don’t try to be everything to everyone. Being just like everyone else—If so, you’ll blend in instead of stand out. Not going evergreen—Evergreen content is relevant over a long period of time. Selling, not helping—Constant selling in your content instead of adding value to your reader is a turn-off. Not using calls-to-action—If you don’t spur your readers on to do something, they won’t. Not proofreading—Everyone makes mistakes from time to time. But continual spelling, punctuation and grammar errors are unprofessional. Not engaging—Don’t ignore your readers comments!—Don’t ignore your readers’ comments!